Never ever lose your self-belief and self-confidence. You got a chance and have been studying the course because you are capable of it. Hence, if you can prepare in the right way, you will definitely succeed. Talking and sharing your thoughts with others like friends, family, relatives or even tutors can help a lot in reducing your anxiety. There is no point in creating mountains of hopes and dreaming to reach the stars. Nobody can be absolutely perfect in every single activity. So, just give your best and accept for the results. Follow a well-balanced diet that is packed with enough vitamins, minerals and other essential nutrients. It is also important that you consume the foods in right amount. Drink lots of water to keep yourself well-hydrated. Avoid all sorts of unhealthy consumables including junk and processed foods, stimulants (coffee, tea, etc. ), alcohol, and so on. Sleeping is absolutely necessary to cope the pre-exam stress in the right way. It not only helps you calm down, but also makes your brain stronger and more efficient. So, make sure that you get a sound sleep of 8 hours each and every day. Exercising is immensely helpful in boosting our energy level, making our mind clearer and increasing our focus. So, make sure that you practice moderate exercises every day for some time. Opt for yoga or meditation, which can help you get a better control over your nerves. Practicing deep breathing exercises can also help you get rid of the stress-causing ‘hyperventilating’ factors, thereby making you feel relaxed. Stop comparing yourself with your friends. Everybody has her own way of learning, reminding and revisioning. Above all, there are lots of differences between the capabilities of two different individuals. So, just do your own work and focus. Give yourself some time to relax and have fun. 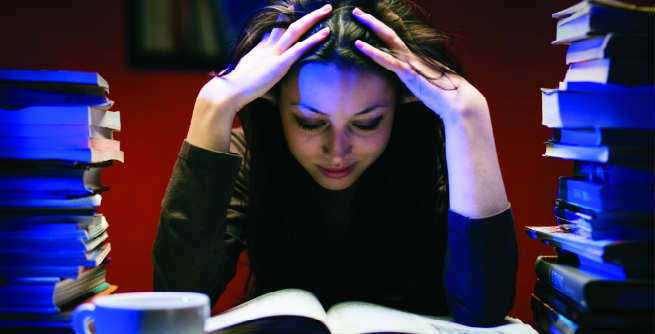 Taking short breaks are really important to kill the pre-exam anxiety and deal with the exam successfully. Therefore, keep taking breaks in between your study hours. Exam is nothing but a short-term project in comparison with the entire life. So, getting stressed will be of no help in the long run. Rather, it would harm you and make you weaker in the way to your life. So, just discard all negative thoughts from your mind and think positive. You will certainly do well in your exam.